Since Zack and I moved in together, we now have a Sunday ritual where my family comes over to have dinner together. We head up to the rooftop, fire up the grills, and watch my dad cook a feast that would bring tears to your eyes, and not just from the grill smoke. I like to contribute more than just my presence when my parents are kind enough to bring over the main course, so side dishes have become my new obsession. If Zack and I were writing this post together he would probably interject that a loaf of bread is the perfect side dish, but since we all aren’t preparing our bodies for sweater weather I figured I’d share with you another maybe more seasonal and healthy option. Squash are everywhere right now, and it’s hard to know what to choose from between acorn, butternut, spaghetti, pumpkin, etc. They may all be similar shades of olive and orange, but the one that stands out among the crowd for winning my coveted “Produce of the Season” award is Delicata. I’m obsessed for two reasons: it tastes incredible and you don’t have to peel it to eat it. Can you say game changer?? 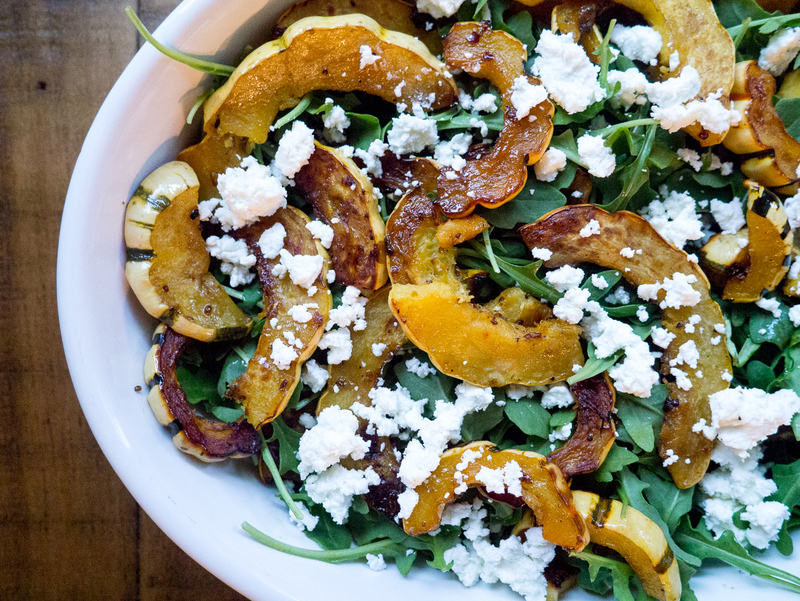 Simply slice the delicata into crescents, roast with a sweet-tart blend of maple, mustard, and balsamic, and toss with goat cheese, arugula, and pumpkin seeds. For an easy weeknight dinner, serve with a roast chicken (that you buy from the grocery 🙂 )and crusty bread to make it a meal! 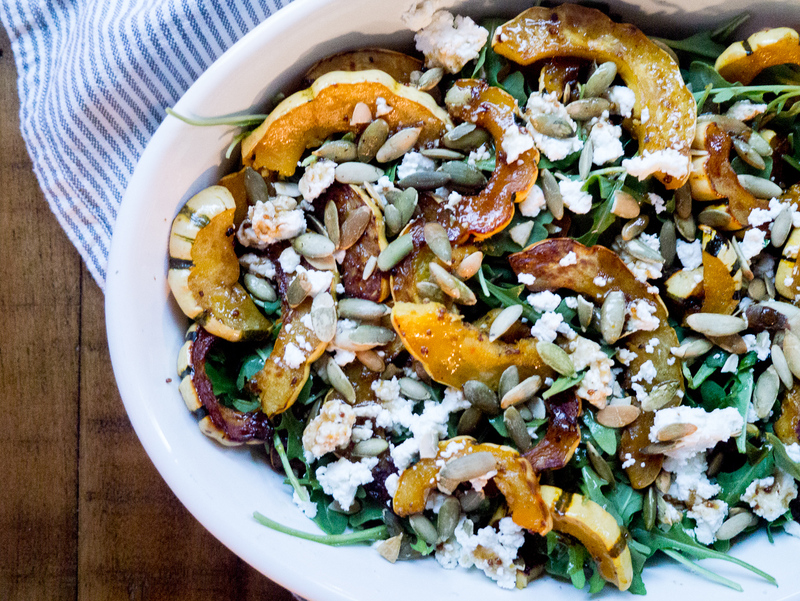 It’s easy, hearty, and has a fantastic blend of different tastes and textures; caramelized squash, crunchy pumpkin seeds, and creamy goat cheese. My mom who is one of those people that “eats to live” (hard to believe we’re related, I know), even said this is her favorite squash she’s ever had. Step 1: find Delicata squash. I find it at Trader Joe’s, and I would bet Whole Foods and most other grocery stores carry it as well. 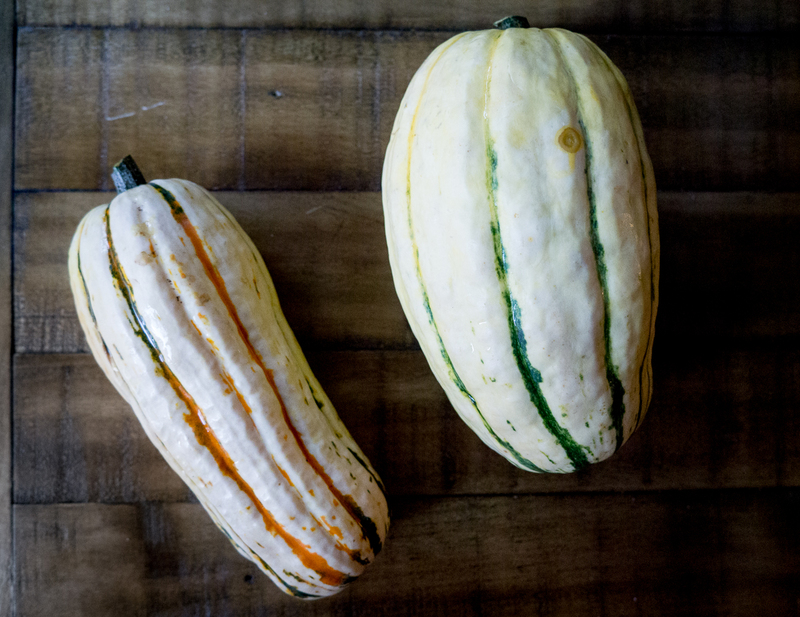 Look for an oval shaped squash with green and orange stripes. 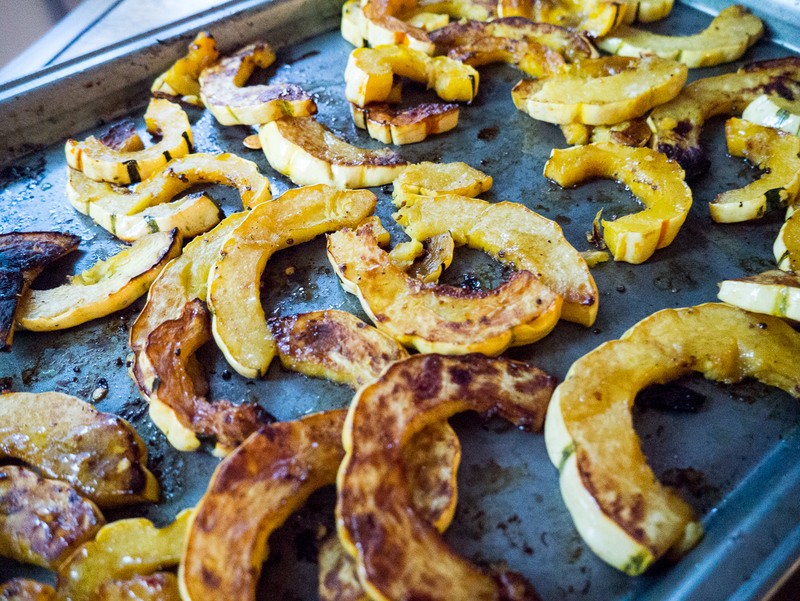 Whisk together maple syrup, dijon mustard, balsamic vinegar and olive oil, and toss the squash in that mixture. 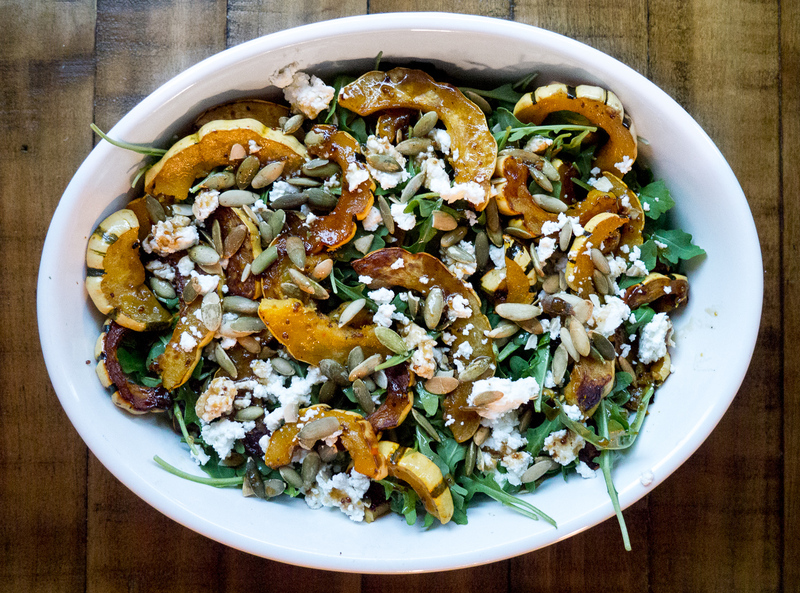 Roast until caramelized and soft, and toss with arugula, goat cheese, and pumpkin seeds. That’s it! So easy, very healthy, and will fulfill all of your fall cravings. Let me know in the comments if you have a favorite fall dish, I would love to try it! Preheat oven to 425 degrees. Whisk together olive oil, vinegar, maple syrup, mustard, rosemary, and red pepper flakes until combined. Cut squash in half vertically, and scoop out the seeds. Slice into 1/2 inch crescents, and toss with half of the balsamic dressing. 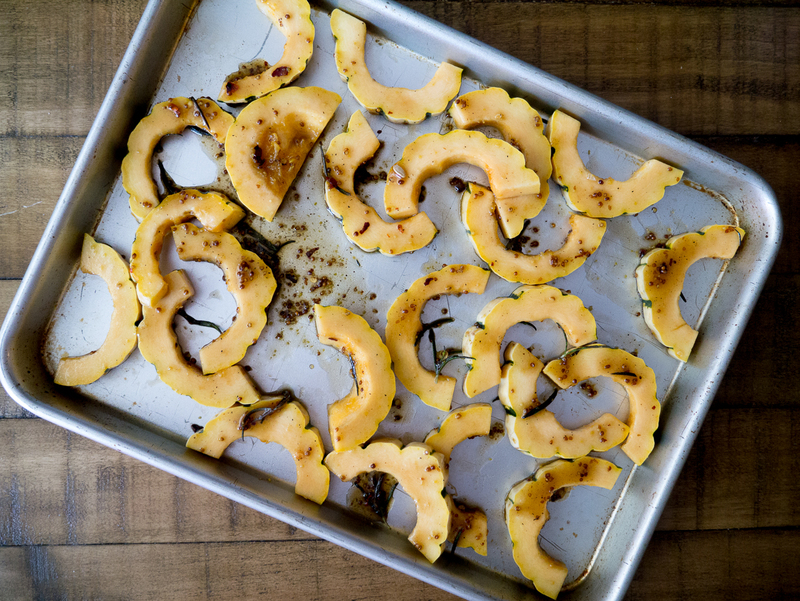 Place squash on a foil lined baking sheet and into the oven. 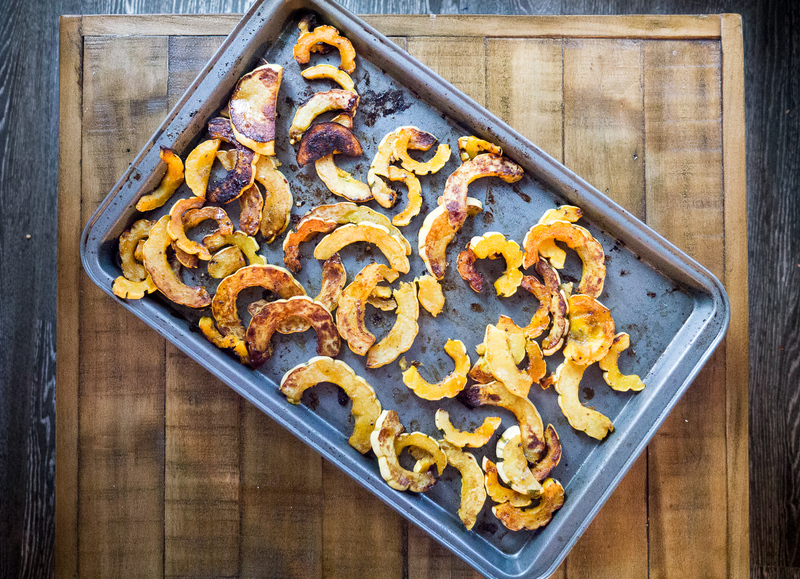 Roast for 45 minutes, flipping squash every 15 minutes until caramelized and brown. 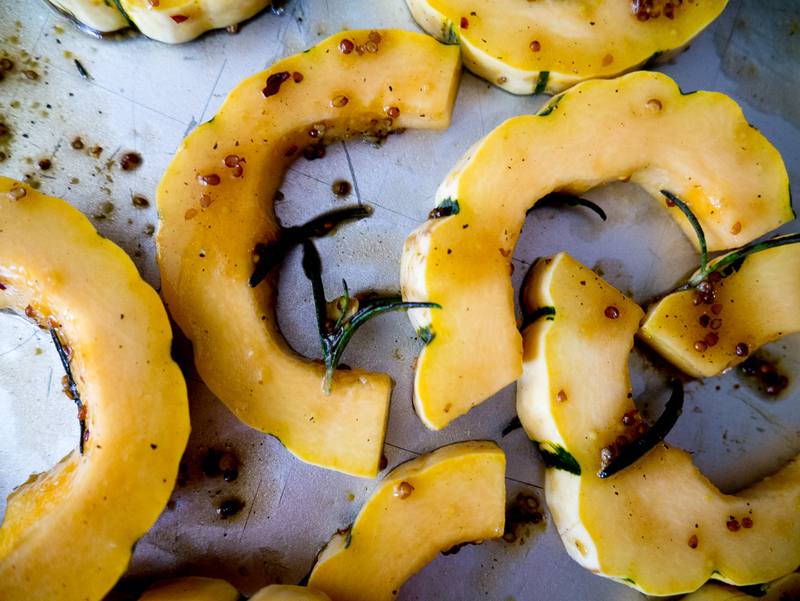 Take the squash out of the oven, and while it cools toss arugula with remaining dressing. 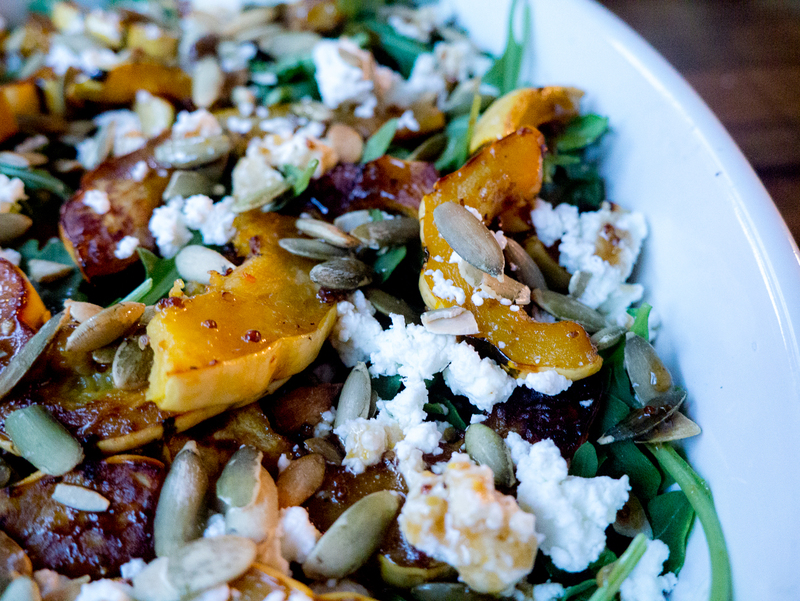 Place arugula into a serving dish and Top with roasted squash slices, crumbled goat cheese, and pumpkin seeds. Beth! I’m so happy to hear that! How was it?? Allen proclaimed it was “sophisticated and delicious”. Great comments from a man who does not care for squash! Our only feedback was the rind on our squash was tough and needed to be cut away. This required a bit more prep but was so worth it. Leftovers are going to the boat this weekend! Thanks Hailey, this is a recipe we will make again. It has wonderful Fall favors. That’s great to hear! Sorry the peel didn’t work out 🙁 Out of curiosity, did you make it with Delicata, or a different type of squash? I’ve had success eating the rind on the Delicata, but I’m wondering if something like butternut would be too tough to eat even after it was roasted… Thank you again for trying the recipe, and it sounds like you’re doing great. We sure miss you at Microsoft! It looked like the squash in your picture. Had the stripes, however it could have been something else. Definitely not butternut. The cashier at Whole Foods was not sure how to ring it up! 🙂 He ended up calling it spaghetti squash just to get me out of there. Things are great. Just got back from Seattle. Send me your email and I will fill you in. Miss all of you.